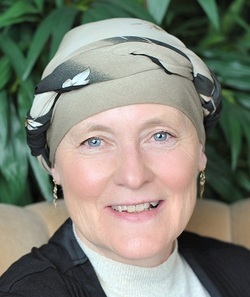 Rahma Krambo is co-owner of a solar business in Northern CA. She is active in the local arts and literary community, member of an SCBWI writers group, Friends of the Packard Library and the Yuba-Sutter Regional Arts Council. After graduating with a B.A. in English and Music from a Midwestern college, I became an expatriate of the "Show-Me" state by hopping onto the back of a motorcycle and riding to the Arctic Circle for the summer solstice with the man whom I would marry. It was the early 70's. After an extended nomadic existence with our three children, we moved to Northern California where we've grown deep roots for the last twenty years. My husband and I own a solar energy business. Life is good. I'm passionate about writing, books, cats, libraries, working for change starting with the heart and home, reading to your kids, a good cup of coffee, homemade bread and organic gardening. 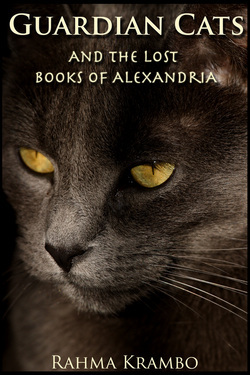 My book, GUARDIAN CATS AND THE LOST BOOKS OF ALEXANDRIA, blends magical realism with legendary historical events, and will appeal to all fantasy lovers. The cats, facing larger than life challenges while remaining true to their feline nature, will appeal to all cat lovers. Writing expands my world and energizes me. I'd be happy if I never had to sleep. I can hardly wait to get up each morning and do it all over again. Cicero, the old library cat is more than he seems -- an elder Guardian charged with protecting an ancient book of power. Buried in a secret chamber, the book is a magnet for attracting the wrong kind of attention. Painfully aware his days are numbered, Cicero is troubled by the fact that he has found no successor. Marco, a house cat alone in the world for the first time, finds refuge in the public library, a suitable home for an orange tabby gifted with the ability to read. But an unlimited amount of reading time is not young Marco's destiny. You might think this is just a story about cats, but it's really a story about power. The attraction, addiction and abuse of power. It's also about the power of words and ideas. Conveying these serious themes is a loosely organized fellowship of cats, a magical book, an evil professor, angelic creatures, mythological demons, a hyperactive ferret, and three gangster raccoons. With the burning of the legendary Library of Alexandria as the story's point of departure, Guardian Cats offers a fictionalized version of this tragic event. Escaping with a bagful of books and an armful of cats, the last librarian places each book in a safe haven… with a cat to guard it. Guardian Cats, a historical fantasy, can be read on several levels. For ages 9 to adult. Both entertaining and thought provoking, the story deals with very human concerns about loyalty, courage, and the overwhelming odds against becoming a hero.